Does Your Phone Number Have a Good Online Reputation? Earlier today, I was talking to a client about a proposal they received from a search engine optimization consulting company. They were interested in finding out whether this particular firm was credible (the industry has more than its share of snake oil salespeople) so I took a look. One step I took was to Google the company’s phone number. When I did this, I found one result. One. That seems rather strange since just about any company will appear in a variety of directories across the web, which would lead to multiple results on Google for a phone number specific search. After that, I took a look at the company’s website and noticed that no physical address was listed. While this particular SEO firm may still be credible, it had two strikes against it based on what I consider to be important credibility measures. Turning to real estate, here is how this plays into marketing yourself or your business: Real estate agents are in a phone-intensive business. There is a good chance that many of the people an agent calls will not have the agent’s contact info in their phone so they may choose to Google the unknown caller’s phone number before returning their call. If they do that, what will they find? 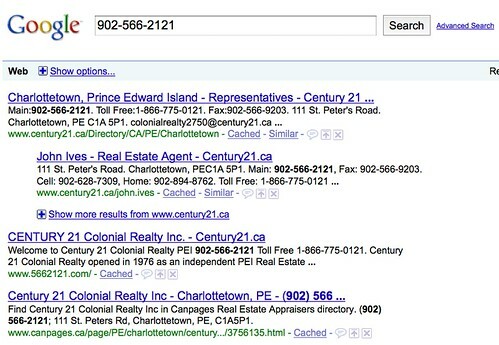 In the above example, the real estate broker, Century 21 Colonial in Charlottetown, Prince Edward Island, shows up at the top of the results when their company’s phone number is searched for on Google. Additionally, if people run that search and click on any of the top results, they’ll end up on a professionally designed website with high quality information about that broker, which surely must increase the chances of a call-back once the call recipient determines who it was that called them. The top site is his own, followed by pages on YouTube and a business directory where his cell phone number is published. And then two property tour videos generated by WhereToLive.com for his listings appear since his cell phone number is used in the description presented alongside the video. Clearly, someone who Googled the number of this agent would immediately understand who called them, what business they’re in, and that they’re someone who understands how to use the web to market themselves and properties. That’s the kind of impression that earns call-backs. On the flip-side, what happens if nothing shows up when someone Googles your company’s phone number or any of your agent’s numbers? 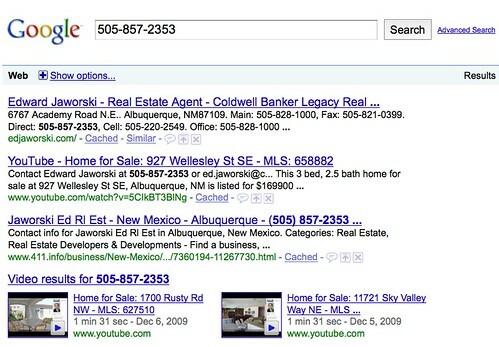 What happens if the top result has nothing to do with real estate? For example, there are some agents using the same phone number for side businesses which could lead to some confusion among prospective real estate clients (are they a full-time agent or not?). And what happens if the top page is incomplete, out of date, or says “no photo found”? The nice thing here is that this is a relatively easy type of search to control. You could include your phone number on social networking sites, in business directories, on blogs, etc. to capture more of the top-10 results for this critical niche of the search landscape. Until you’ve Googled your own number to verify that you’re presented well online, you may not understand why you’re having trouble getting call-backs. Thanks for the plug…many offices spent many years prior to the web promoting their phone number so it just seemed like something to do to promote it online…it is quite remarkable when we check our search terms that get people to our site…how many variations of our phone number are there. If search engines are replacing the yellow pages…dont forget your phone is still a very important tool…make sure the public can find your number !